Uxizandre dug deep to repel the late charge of runner-up Oscar Whisky to record a one and a half length victory in the Pinsent Masons Manifesto Novices' Chase at Aintree this afternoon. The 11/4 shot had seen off the challenge of recent Arkle winner Western Warhorse as the pair approached the second-last fence but the runner-up began to stay on strongly as the field jumped the last. However, jockey A P McCoy had enough in the tank to hold his rival at bay and the horse galloped on strongly to land the Grade One prize. "He's done that very nicely," said trainer Alan King. "I thought if he ran as well as he did at the Cheltenham Festival (when he was second in the JLT Novices' Chase behind Taquin Du Seuil) then he'd have a chance and he's done just that. "I trained this fellow last year for the Million In Mind partnership and I spoke to Frank Berry (owner J P MacManus' racing manager) before he went to the sales and told him he was a nice horse. "He went to Doncaster (Bloodstock Sales) and he bought him for £100,000. Luckily he kept him with me!" Frank Berry was also happy with the six-year-old and revealed after the race that he will now be put away for the season. "It's nice to see him put in another good performance after his run at Cheltenham," said Berry. "That'll be it now for the season." Oscar Whisky, twice a Grade One winner over hurdles at this meeting for trainer Nicky Henderson, returned to the track and went down fighting over the larger obstacles. 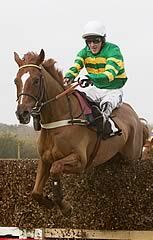 Barry Geraghty had been aboard the 7/4 favourite when he unseated at the first fence in the JLT Novices' Chase at the Cheltenham Festival, and was again in the plate as the nine-year-old closed down Uxizandre to be beaten a length and a half. Henderson said: "It was a great run and to be fair he has had a great season. "Barry was very happy with him and thought he might have got to the winner over the last. "He made a couple of sloppy jumps but finished the race well and it has been a good year for him. "He didn't really go to Cheltenham with what happened there so we might have a look for a race at Sandown. The Celebration Chase would be too short for him but there might be something else, although he won't go to Punchestown." A P McCoy, who rode Uxizandre to victory in the Grade One Pinsents Masons Manifesto Novices' Chase, said of the Alan King-trained winner: "He's much better on a left-handed track, which limits him a bit, but the Ryanair Chase could be a long term goal, and he has plenty of pace, so could be dropped back in trip. "It's nice that he has won a Grade One at the end of his novice season, and that will probably be it for now. He looked fantastic and Alan had him looking great. He may well have improved since finishing second at Cheltenham [in the JLT Novices' Chase]. "I rode him in a handicap at Warwick two runs ago and dropped him in - he was a little too exuberant and likes to get on with it. I disappointed him, and, in fairness to Choc [Thornton], he told me he rode him at Market Rasen on one occasion, dropped him in and he didn't go a yard. He's a horse that likes to be up there and getting on with it." David Pipe, who trained third home Western Warhorse, said: "He had a hard race at Cheltenham [when winning the Racing Post Arkle Chase], and had nothing left turning in today. I would imagine it will be two-mile races next season. He doesn't help himself by being so exuberant before races, which doesn't help him at the end of races - hopefully with age he will settle down." 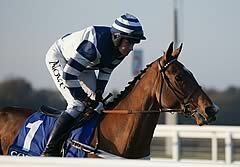 Roger Brookhouse, the owner of Western Warhorse said: "Was he beaten by the trip, or by the hard race at Cheltenham? We don't know, but I would think he will be off on his holiday now." The Manifesto Novices' Chase is named after Manifesto, a horse which ran eight times in the Grand National between 1895 and 1904. He won the race twice, finished third on three occasions and was fourth once. 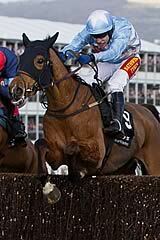 The Manifesto Novices' Chase was established in 2009, and it features horses which ran previously in the Arkle Challenge Trophy and the Golden Miller Novices' Chase.